OUR STORE NUMBER IS 616-214-2472. The number to the left under our store photo is not correct. We will retain this number once our store on Alpine closes. Make sure you are signed up for emails, that is where we send out info on new product arrival, classes and current specials! 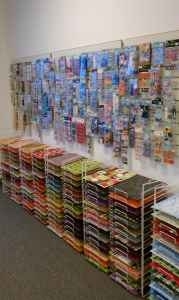 To everyone that is not familiar with us we are a discounted scrapbook store with a very large selection of suppiles. We place all our products cheaper than the large chain stores. Don't believe me, compare prices, you will find we beat them all! My jolees are 60% off retail if not MORE! We have over 2, 000 styles in stock! We also carry k&company, paper bliss, sticko, martha, 7 gypies, soft spoken and so much more! We pride ourselves in our large stock of cricut cartridges over 100 different ones to choose from. All ranging $20-$30 (nothing over $30!) We also carry a lot of patterned paper including DISNEY. All paper is $.25 and our patterned paper is unique and I haven't found it in another store! If you have a question, we would be happy to try to help you! Untitled Post Lots of new discount dies available! Thanks to everyone who came to the CUSTOMER GARAGE SALE! Vendors and shoppers had a great time and it was a wonderful success! We will have another soon! Washi tape We now proudly carry many varieties and styles of washi tape!